TradCatKnight: Apostasy Watch: Francis, "Prayer is Treasure for all Faiths"
Apostasy Watch: Francis, "Prayer is Treasure for all Faiths"
Francis greets an interfaith group in St. Peter's Square for his general audience on Oct. 28, the 50th anniversary of the Second Vatican Council declaration Nostra Aetate, which changed the relationship with people of other faiths. 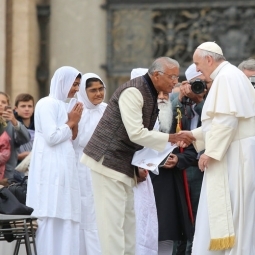 The Oct. 28 papal general audience focused on interreligious dialogue. 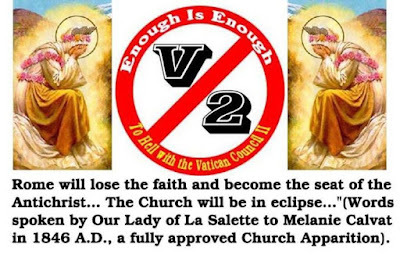 Francis marked Wednesday's anniversary of the Second Vatican Council's declaration on the relation of the Church to non-Christian religions by saying the world looks to religious believers(??) for their ability to pray. “Prayer is our treasure, to which we draw in accordance with our respective traditions, to ask for the gifts for which humanity yearns,” he said at his Oct. 28 general audience in St. Peter's Square. The world looks to believers for answers in many areas, the Pope said, such as peace, hope, environmental crisis, violence committed in the name of religion and crises in the family and the economy. Pope Francis' remarks came on the 50th anniversary of the release of Nostra Aetate, and his general audience was focused on interreligious dialogue. Other speakers included Cardinal Jean Louis Tauran, president of the Pontifical Council for Interreligious Dialogue, and Cardinal Kurt Koch, president of the Pontifical Council for Promoting Christian Unity. The Pope extended a special welcome to those individuals and groups present in St. Peter's Square representing other religions. Pope Francis recalled the various interreligious initiatives and events that have sprung up in the years following Nostra Aetate's release. He noted in particular the interreligious encounter in Assisi, Italy, in 1986, the fruit of a meeting between St. John Paul II and a group of young Muslims in Casablanca a year earlier. “The flame, ignited in Assisi, has spread around the world and is a permanent sign of hope,” he said. The Pope noted that Nostra Aetate promoted renewed relations not only with the Jewish people, but also with persons of other religions, especially Muslims. He cited passages from the document that acknowledge the points of commonality between Christianity and Islam (heresy we pray together with Muslims to same God): reference to the paternity of Abraham, the veneration of Jesus as prophet and esteem for Mary, as well as such practices as almsgiving and fasting. Pope Francis spoke of the “violence and terrorism” that has led to religion becoming the object of suspicion and condemnation. The Pope went on to remind those present that the upcoming Year of Mercy, beginning in December, will offer an opportunity for those works of charity. Pope Francis concluded the audience with an appeal for victims of the earthquake that struck Pakistan and Afghanistan on Monday. The Guardian reports that more than 370 people have been killed and thousands injured in the 7.5-magnitude quake, which also affected the Kashmir region. Scores of homes have also been destroyed, causing concern with the approaching winter months. It was 50 years ago, back in 1965 that the Catholic Church broke ground by starting a new chapter in its approach to non-Christian religions. The declaration titled 'Nostra Aetate' was issued by the Second Vatican Council, to re-direct the Church's attitude towards Judaism. To mark the anniversary, representatives from several religions attended the Pope's weekly general audience in St. Peter's Square. Even though the original purpose of the document was to improve the relationship with the Jewish people, a domino effect quickly followed. 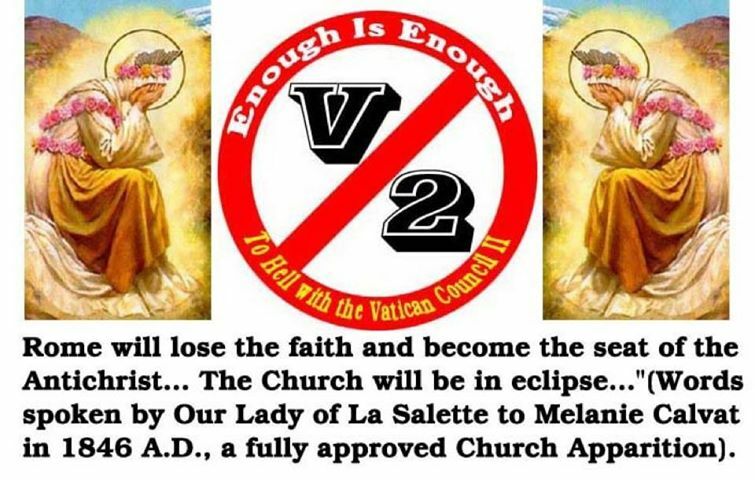 From that document, the Vatican's inter-religous meetings in Assisi, gave rise. Led by the Pope, leaders from different religions meet under one same roof. To mark the anniversary, the Vatican also launched an International Congress in Rome. Big improvements have been made since the document was issued. But the Pope reiterated that much more still needs to be done to foster mutual collaboration and respect.